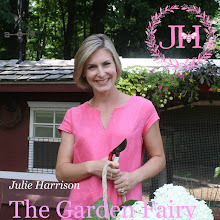 Julie The Garden Fairy: Stretch It! Forsythia in full bloom- in my house- before there is a peek of yellow on the shrub in my garden. P.S. I realized too late my prior post contained several typos. This was the result of writing past my bed time after an exhausting day of juggling a one year old and a spring garden. I will try to be more careful next time.